Browne, Randy M. Surviving Slavery in the British Caribbean. University of Pennsylvania Press, 2017. Atlantic slave societies were notorious deathtraps. 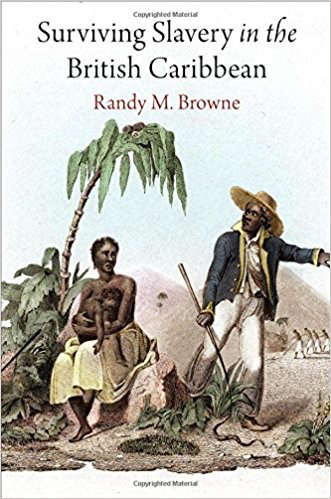 In Surviving Slavery in the British Caribbean, Randy M. Browne looks past the familiar numbers of life and death and into a human drama in which enslaved Africans and their descendants struggled to survive against their enslavers, their environment, and sometimes one another. Grounded in the nineteenth-century British colony of Berbice, one of the Atlantic world’s best-documented slave societies and the last frontier of slavery in the British Caribbean, Browne argues that the central problem for most enslaved people was not how to resist or escape slavery but simply how to stay alive. Guided by the voices of hundreds of enslaved people preserved in an extraordinary set of legal records, Browne reveals a world of Caribbean slavery that is both brutal and breathtakingly intimate. Field laborers invoked abolitionist-inspired legal reforms to protest brutal floggings, spiritual healers conducted secretive nighttime rituals, anxious drivers weighed the competing pressures of managers and the condition of their fellow slaves in the fields, and women fought back against abusive masters and husbands. Browne shows that at the core of enslaved people’s complicated relationships with their enslavers and one another was the struggle to live in a world of death. Provocative and unflinching, Surviving Slavery in the British Caribbean reorients the study of Atlantic slavery by revealing how differently enslaved people’s social relationships, cultural practices, and political strategies appear when seen in the light of their unrelenting struggle to survive.